This guide offers all the essential information about naloxone – the lifesaving antidote for opioid overdose. The information here is NOT a substitute for medical advice – it is intended to serve as a general guide to increase overall awareness of naloxone. ALWAYS seek information from your doctor or pharmacist. Knowing how to use naloxone to reverse an overdose could mean the difference between life and death. By now most people have heard about naloxone, even if they’re not quite sure what it is. Naloxone (Narcan, Evzio) has been a hot topic in the news and in public health policy as a proactive measure against the dramatic increase in American overdose deaths. This is the essential guide for everything you need to know about naloxone. Opioid is the broader class and includes opiates. For simplicity, we use one term only, opioid. Is Narcan the same as naloxone? Naloxone is the generic name of the medication sold under brand name labels of Narcan and Evzio. Opioids slow your breathing, potentially ceasing breathing function altogether. Naloxone works by binding to opioid receptors in the brain and inhibiting the uptake of opioid molecules. In doing so, the overdose can be reversed and respiratory function can resume. Yes! Naloxone saves lives. There is no denying it. If you notice these signs, whether one or several, respond right away. If the person appears unconscious, shout their name and shake them. Do they respond? If the answer is no, try eliciting a pain response by rubbing your knuckles over their sternum or, if you can’t get to their sternum, rub just above their upper lip area, beneath the nose. The goal here is to see if they react to mild pain. If they do not react immediately, move on as this is likely a life threatening situation and time is of the essence. Call 911, start rescue breathing if necessary and prepare to administer naloxone. According to Sharon Stancliff, MD of harmreduction.org, whether you call 911 or give naloxone first depends on which is more readily accessible. The point is to intervene as quickly as you can and call for additional help. Use a needle to inject 1cc (1mL/100u) of the medication directly into a muscle or under skin (thigh or shoulder are best), administering through victim’s clothing if necessary. Buttocks injections increase the risk of sciatica, especially when given by untrained individuals. Stay with the victim until emergency help arrives! Even with successful reversal of overdose symptoms, the person can still revert to an overdose state if the medication wears off before the opioids. It is important to know that one dose of nasal naloxone comes as a kit with 3 pieces: an atomizer (tip that is inserted into nostril), applicator (tube with a removable yellow piece at each end) and a glass vial of medication. All three items are included with an intranasal naloxone kit and are necessary for administration. Just as with naloxone injection, wait 2 or 3 minutes to see if the medication starts working. If no sign of symptoms reversing, administer a second dose and continue rescue breathing as you wait for help. The opiates that caused the overdose may outlast the naloxone so be sure to watch for signs that the person is returning to a state of overdose. Naloxone lasts 30-90 minutes. It is important to know that the effects of opioids, including respiratory arrest, can last several hours, while naloxone will last anywhere from half an hour to an hour and a half. This means that even if the naloxone is effective in reversing the overdose, it could wear off before the opioids and the individual would again be at risk for overdose. Stay with the person until you are certain the opiates have worn off or until help arrives. According to harmreduction.org, naloxone does not have any side effects, even if an individual is not overdosing and/or has no opiates in their system. While the medicine does not have any contraindications, for someone who is opiate-dependent, administration may cause symptoms of withdrawal. Withdrawal symptoms are positively correlated with the amount of naloxone received. That is, the more naloxone administered, the stronger the feelings of withdrawal. If a person is feeling symptoms of withdrawal after administration of naloxone, the site also suggests letting the person know that the “dopesickness” will only last about half an hour or so. It is important to encourage the person to wait it out, instead of using more drugs to counteract the discomfort, as this can put them at risk for another overdose as soon as the naloxone begins to wear off. Does naloxone make people violent? Naloxone itself does not make people violent. If someone exhibits agitation or violence upon arousal from the overdose state, this is likely due to confusion and possible symptoms of withdrawal. In the case of such agitation, talking to the victim is suggested. Explain what happened and let them know that any feelings of withdrawal will wear of as the medication wears off. Intranasal or intramuscular naloxone – which is better? Both are excellent, and deciding which one to use is a personal decision. It should be noted, however, that intranasal naloxone eliminates the risk of needle stick to the person administering the drug. This can be especially beneficial when administering the medication to a known intravenous drug user (IVDU). IVDUs belong to a population at high risk for contracting blood-borne pathogens such as Hepatitis C (HCV) and Human Immuno-deficiency Virus (HIV). Can I get high on naloxone? You cannot get high on naloxone. If it is used by someone who has no opiates in their system, it would have the same effect as water. The medication has no potential for abuse or dependency. Is naloxone safe for everyone? Yes. While the kit to administer naloxone (small parts, fragile glass vial, needle) could potentially cause harm to small children and pets, the medication itself is relatively safe. The medication only inhibits the binding of opiates to receptors in the brain. If there are no opiates present, the medication does not do anything, except in the unlikely event of a severe allergic reaction. It is listed as a Schedule C medication during pregnancy, which means it has shown to have some adverse effects on animal fetuses, but has not been adequately studied in humans. Ultimately, use of Schedule C medications are believed to be warranted if the benefits outweigh the risks of using the drug. The FDA has approved the use of naloxone in infants who have been “narcotized” or who have received narcotics through their mother. Naloxone is traditionally obtained by prescription, but in 2015 CVS announced stores in 14 states would be selling naloxone without a prescription. You can also check the prevent-protect.org website to find more info regarding naloxone availability based on your location. The cost of naloxone varies from free (with the help of programs such as Project Lazarus) to several hundred dollars. Most insurance plans will help cover some, if not all, of the cost, including private insurance and Medicaid. Naloxone should be stored at room temperature, away from direct sunlight and should not be exposed to extreme heat or cold. Do not store naloxone in the refrigerator. Naloxone has a shelf life of approximately 18-24 months and is required to have an expiration date at least 12 months out from the date of the prescription. Expired naloxone should be replaced with a new kit. According to the harmreduction.org website, using expired naloxone is better than nothing, if it is the only thing you have. Like many medications, its effectiveness decreases after the expiration date, but that does not necessarily mean it won’t work. It may be just effective enough to reverse the overdose and using an expired kit will be better than doing nothing at all. Be sure to dispose of expired kits properly! Start by inquiring at your pharmacy for disposal options. Naloxone was patented by inventor Jack Fishman in 1961 for the treatment of constipation due to opioid use. It was not known at the time that it would later save thousands of lives and become a hallmark drug in the response to the opioid epidemic. Naloxone became a household name in the 90’s, when distribution of the drug was opened to lay people. 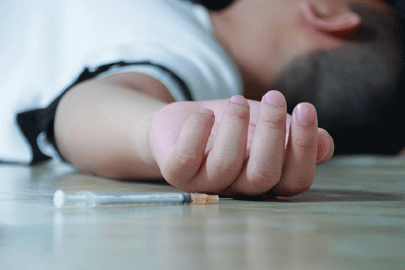 Does naloxone encourage drug use? The argument that access to naloxone increases or encourages drug use has yet to be proven. The thought is that naloxone instills a false sense of safety and encourages users to push past “safe” levels of use. Furthermore, some argue that providing an antidote sends the message that drug use is socially acceptable. As one scientific article points out, these arguments have no research to back them up, and to limit access to a life-saving drug based on unfounded theories is just plain unethical. Do you or someone you know need help with an opiate addiction? Detox, followed by inpatient or outpatient treatment can provide a great foundation for recovery.